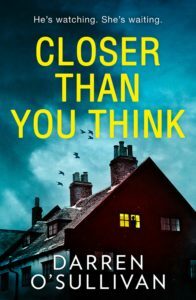 Closer Than You Think by Darren O’Sullivan is a very thrilling contemporary psychological thriller that will definitely have your heart racing. I can honestly say that the tension in me rose as I sped towards the wow, wow, wow moment! Closer Than You Think is not a book to be read alone, or at night. This book will give you nightmares and send your blood pressure soaring. The action is written from the point of view of the killer in the third person and the intended victim in the first. Tensions rise for the reader as we know what the killer intends to do and when they intend to do it. The plotline was very cleverly thought out. I am afraid I made exactly the same mistakes as the victim did. I was manipulated by the author and I didn’t realise it at the time. Brilliant. Danger lurks behind every corner. Fear, mistrust and panic are catching. The killer was certainly closer than you think! A marvellous novel. I cannot wait for more from Darren O’Sullivan.